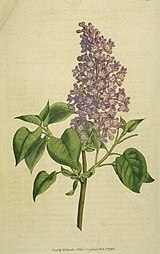 Purple lilac represented ‘first emotions of love’ in the language of flowers. The ‘language of flowers’ or ‘floriography’ emerged with the Romantic movement in the early 19th century, although there is even some reference the plants having meaning as far back as Shakespeare’s day. The expression ‘language of flowers’ itself can be found used as far back as 1759. 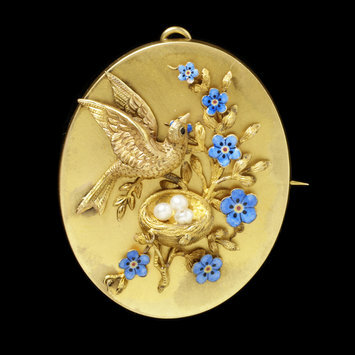 Naturalistic jewellery, decorated with realistic flowers or fruit or plants became popular in the early part of the 19th century and remained so for many decades. (Many would say that The Art Nouveau movement with its love of natural form had it’s roots in the early Naturalistic movement). Perhaps no other type of jewelry can better represent the Romantic movement than naturalistic jewelry with its attached symbolism. 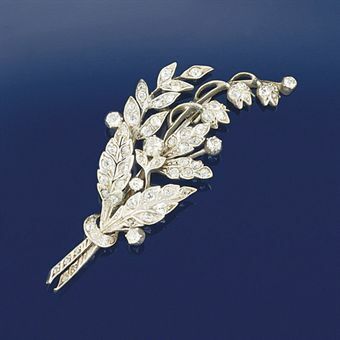 To the people of the 19th century, every plant and flower had a particular meaning; wearing a natural motif on a jewelry piece had deep significance. They really took the expression ‘say it with flowers’ to heart. It has been said that sometimes secret messages were even conveyed to potential suitors by wearing a particular piece of jewelry and feelings that could not otherwise be expressed were communicated, although there is no specific evidence for this. It seems unlikely, as these meanings were widely published and known so it would be hard to keep it secret from everyone else also. However, giving a gift with a particular plant or flower would be sending a message to the recipient, generally of love or friendship. What I find so moving and truly touching about the language of flowers, is that the Victorians felt there were so many different kinds of love, affection, friendship and nuance of feeling that our normal range of words were not enough; they required an entire symbolic vocabulary to say what they felt. To the Victorians, matters of the soul, romance and human emotion were central and love of the natural world was an integral part of their existence. By the 1850s, naturalism could be genuinely called a movement in its own right. The movement could be said to have its roots in the 19th century fascination with botany and also the influence of Romantic poets such as Wordsworth. By the mid-century, the delicate and more naturalistic early jewelry designs had been replaced by more extravagant and glittery motifs of flowers and foliage. Flexible or coiled stalks called tremblers gave the effect of quivering and movement. These larger and more glamorous pieces were meant for grand occasions but could often be dismantled into separate, simpler parts. Of course, not everyone agreed on which plants had which meaning and interpretations did vary according to time and place, but overall a pattern did emerge. Sadly, much of this beautiful symbolism has been lost to our memory, although the meaning still remains for us in flowers such as the rose, which everyone in our era knows signifies romantic love and the four-leaved clover, which we all know means good luck. In this post I will illustrate some of the more common flower and plant motifs loved by the people of the 19th century and their generally agreed upon meaning; over time I will add more to this post as I find relevant pictures. However, I am not going to list all of the separate meanings as there really are so many. If you would like to know more I highly recommend that you look at ‘Language of Flowers by Kate Greenaway, 1846-1901.’ It’s a beautiful book and it lists hundreds of flowers and their meanings. There is a link to the read the entire book online in the sources at the bottom of the post. There are also two lovely French books if you read French. The French loved the language of flowers as much as the English and it also was a form of communication loved by many other countries. What is interesting is that the French and the English seemed to more or less agree on the symbolic meanings. The forget-me-not was one of the most important flowers to the Victorians. 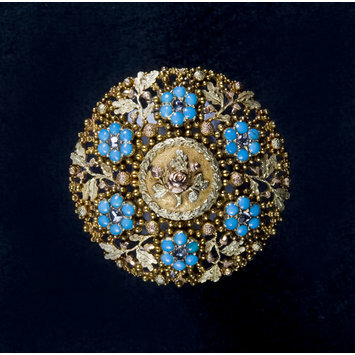 London, c. 1855 -1873 Gold, enamel, pearls and hair compartment in the back. 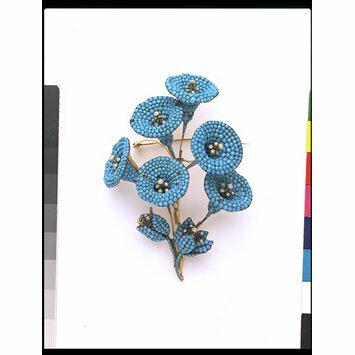 This sentimental brooch with forget-me-not motif would have had a great deal of meaning for the wearer. Youth, innocence, freshness. Quite often seen in bridal wear.